Let’s talk about the Continuous Rasterize and Collapse Transformations switch in this After Effects tutorial. In After Effects there are a lot of confusing terms, but two terms that seem to stump Motion Designers again and again are Continuous Rasterize and Collapse Transformations. If you’re reading this article there’s a good chance that you are trying to figure out what these terms mean. Well the good news is from a practical standpoint the Continuous Rasterize and Collapse Transformations button is not difficult to use. However, if we want to understand exactly how this tool works we’re going to have to explain some intermediate-level topics. So put on your thinking caps, we’re about to learn some important Motion Graphic information. If you would prefer to watch a video check out the tutorial below. The tutorial covers everything outlined in this article. There are even some helpful animated graphics in the tutorial that help to explain what’s going on. If you want to download the free project file just click the download link below the video. To download the project file used in this video just click the download link below. The project file is available to every free subscriber at School of Motion. Download the Continuous Rasterize and Collapse Transformations project file. What is the Continuously Rasterize and Collapse Transformation Button? Note: After Effects also renders the bottom layers before the top, but like the fact that the dog from Blue’s Clues is a girl, that’s not important for this article. If you’ve used After Effects for any amount of time then you’ve probably been working with this render order subconsciously. This very specific rendering order is why effects like fractal noise scale up as you change the scale of your layers. It’s also why masks pixelate when you scale them up. Most of the time this render order is perfectly fine, but under a few different scenarios this render order can be less-than-ideal. This is where the Continuously Rasterize and Collapse Transformation switch come into play. You’ll notice how transformations are moved to the beginning of the rendering order. This might seem like a non-consequential difference, but when it comes to your workflow in After Effects this is actually a HUGE change. The typical After Effects render order and the render order with the switch applied. The biggest change comes from the way in which Effects and Vector Files are rendered, and to explain that concept we’re going to focus on the first major function of this switch. What does Continuously Rasterize do in After Effects? As you may or may not already know After Effects is a raster-based software. This means layers must be converted into pixels to be used in After Effects. Most assets that you bring into After Effects will already have pixel information that After Effects can use, with one big exception… vector layers. 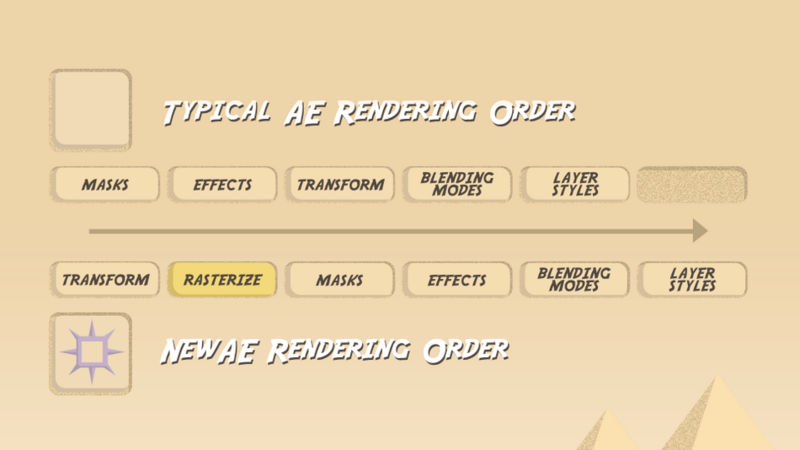 Vectorized assets pose a problem to After Effects because AE requires that every object be ‘rasterized’ in order to drop it into your timeline. So to make vector files usable After Effects automatically rasterizes any vector objects that you bring into your composition. This happens only once, before you even drop your vector file into a timeline. How Do You Remove Pixelation from Vector Files in After Effects? If you’ve found yourself with a pixelated vector file in After Effects there’s no need to cry. There’s a quick and easy solution. All you have to do is hit the Continuously Rasterize switch to the right of the ‘Source Name’ in the timeline (It’s the switch that looks like a compass). Notice how the pixilation is removed. It's magical! The fractal noise effect is not tied to the transformation data. Neat! One benefit from this new render order is that masks can be scaled up without pixelation. So if you are ever dealing with pixelated masks in After Effects just hit the Continuously Rasterize switch for that layer in the timeline. What does the Collapse Transformations switch do in After Effects? Now that we’ve talked about the Continuously Rasterize feature in After Effects let’s talk about the other function of this handy switch, Collapse Transformations. As we’ve already talked about above, anytime you hit the Collapse Transformations and Continuously Rasterize switch in After Effects you will change the render order of your layer. This applies to any potential layer in After Effects, not just vector layers. But when you apply the switch to a nested composition your transformation data between the nested composition layer and the layers contained in that composition will be connected or ‘collapsed’ as After Effects puts it. 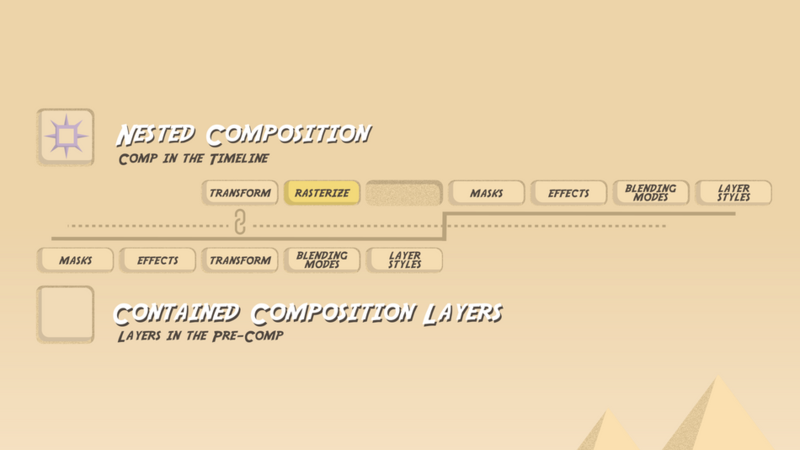 From a practical perspective this means that any transformations you make to the nested composition in the timeline will affect all of the layers in the contained composition as well. This removes the typical 2D restrictions that apply to most pre-composed compositions. Note: The render order will start with all of the layers in the nested composition and ultimately end with the composition being rendered as a layer in the timeline. Now this concept can be really confusing without an example, so let’s talk about a few of the benefits of the Collapse Transformations feature. Typically when you precompose a layer or series of layers in the timeline the nested composition interacts like footage in the timeline. What I mean by this is that all of the layers contained in the composition will be rendered as a 2D footage layer. If you hit the 3D button you’ll see that your 2D footage layer is flatter than steamrolled silly-putty. Essentially, the 3D properties of your layers inside will not be retained. The edges of the frame are cut off because the pre-comp is acting like footage. However, When you have the Collapse Transformations switch selected, your contained layers will RETAIN their 3D properties. This means your pre-comp will work much more like a folder that houses all of the 3D layers, rather than a 2D footage layer with edges. This completely removes the borders from your composition. Nothing is getting cut off. High Five! This is super handy if you need to organize all of the 3D objects in your scene or if you want to retain the 3D position of your layer in your timeline when you pre-compose. Now it’s important to note the rendering order for compositions with Collapsed Transformations. Any effects applied to a nested composition will take priority over the effects applied to the individual 3D layers contained inside. If you apply an effect to your nested composition your 3D layers will lose their ability to interact with other 3D objects in your timeline. This means features like casting shadows, accepting lights, and passing behind other 3D layers in the composition will be nullified. By using the Collapse Transformations switch you can give yourself the ability to adjust the transformation data for multiple 3D layers from a single composition layer. In a way, this makes your pre-comp transformation data act as if it was a parented null object to all of the 3D layers housed inside. 3D transformations tied together with collapse transformations. All of these icons are in the same pre-comp. One of the easiest uses of the Collapse Transformations switch is simply to organize your 3D layers. Because of this switch you don’t have to sift through hundreds of 3D layers. Once you get your transformations right just precompose the composition and hit that Collapse Transformations effect. I hope you’ve learned a lot from this article and tutorial. This term can definitely be confusing so feel free reference this article in the future as you have questions. The biggest takeaway is that the Continuous Rasterize and Collapse Transformations switch changes the render order of your layers in the timeline. By using the Continuous Rasterize feature you can depixelate any vector object in After Effects. And by using Collapse Transformations you can connect transformation data between nested and contained compositions.